When we first began to visit Maine we learned that unlike many parts of the country, Maine’s diners had not only survived, but many of them thrive, whether along the coast, in popular tourist destinations, or in more remote areas of the Pine Tree state. As we began to explore the state, we also began to explore the diners – enjoying the friendly, family-oriented atmosphere, the good, old-fashioned, styles of cooking, the variety of food on the menu, and the classic diner meals. We found you could get anything from a hot dog or a grilled cheese sandwich, to a steak dinner, a classic Maine lobster dinner, or almost anything in between. There there was dessert. Oh, my, was there dessert! Ice cream and a variety of pies, fresh from the oven! We quickly discovered that this was the best place to get blueberry pies! 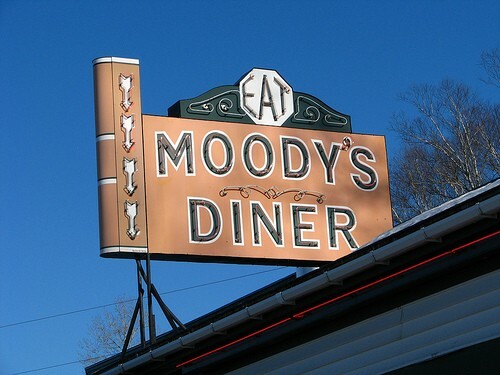 Practically every part of Maine has a diner (or two, or three…). From the world famous Maine Diner in Wells (where tourists sometimes visit in hopes of seeing one of the famous neighbors from Kennebunkport, the Bush family), to Moody’s Diner in Waldoboro (decorated with photgraphs of visitors who purchased a Moody’s Diner T-shirt, then sent back a photo of themselves wearing it in remote parts of the world), to the smaller and less well-known diners in all corners of Maine, the food is good, the company pleasant, and the atmosphere delightful (and the pie is great, too!). Below is a map from Brewster House Bed & Breakfast which you can use to get directions to the various diners. There are a lot more diners in addition to the ones listed on the map. We’ll be adding more over time, but feel free to give us a shout if we’ve missed one of your favorites, and we’ll gladly add it to the map. Save a piece of blueberry pie for me!